This exceptional espresso blend was selected as the No. 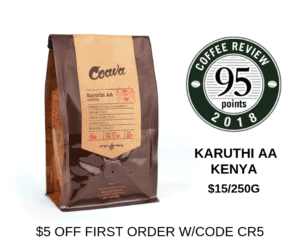 6 coffee on Coffee Review’s list of the Top 30 Coffees of 2018. This blend was designed to celebrate Barrington Coffee’s 25th anniversary as an artisan roaster dedicated to elite coffees, fresh delivery and roasting that foregrounds the coffee and not the roast. Visit www.barringtoncoffee.com or call 800-528-0998 for more information.